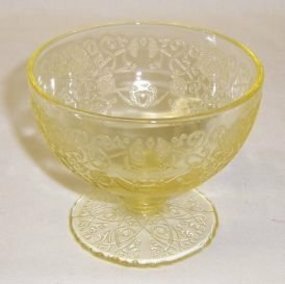 This really pretty yellow Florentine Number 1 Poppy Number 1 depression glass 2 3/4 inch Footed Sherbet was made by Hazel Atlas from 1932 to 1935. 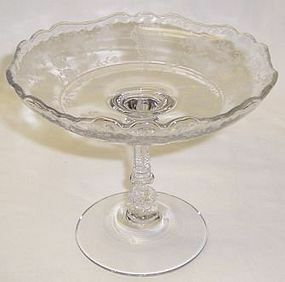 This Sherbet is in very good condition with no chips or cracks. 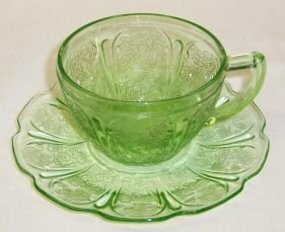 Be sure to search our other Florentine available. We guarantee all items to be as described. Feel free to email any questions. THANK YOU. 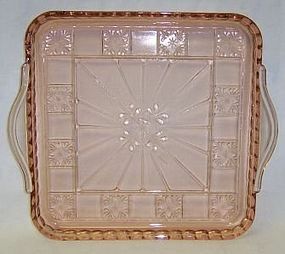 This pretty pink Doric depression glass 8 inch X 8 inch Handled Relish Tray was made by Jeannette Glass from 1935 to 1938. 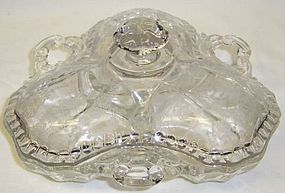 This Tray is in very good condition with no chips, cracks or scratches. 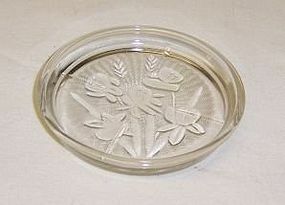 There is a 1 inch mold mark on the bottom of the tray done in the making. Be sure to search our other Doric available. We guarantee all items to be as described. Feel free to email any questions. THANK YOU. 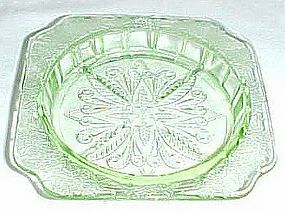 This pretty green Adam depression glass 3 7/8 inch Coaster was made by Jeannette Glass from 1932 to 1934. 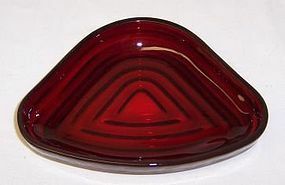 This Coaster is in very good condition with no chips or cracks. 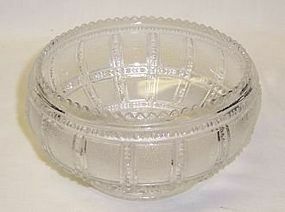 There is a pin point mark that you can catch your fingernail in on the inner rim - very minor. Be sure to search our other Adam available. We guarantee all items to be as described. Feel free to email with any questions. THANK YOU. 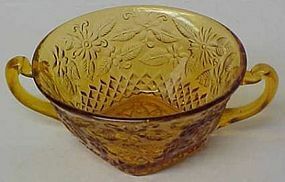 This pretty depression glass amber Pineapple & Floral Number 618 Cream Soup Bowl was made by Indiana Glass from 1932 to 1937. This Cream Soup is in very good condition with no chips or cracks. 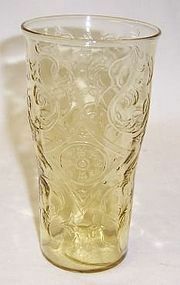 Be sure to search our other Pineapple & Floral glass available. We guarantee all items to be as described. Feel free to email with any questions. THANK YOU. 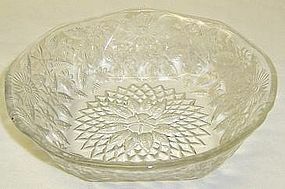 This pretty crystal depression glass Pineapple and Floral Number 618 6 Inch Cereal Bowl was made by Indiana Glass from 1932 to 1937. 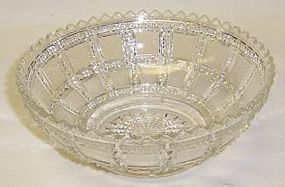 This Cereal Bowl is in very good condition with no chips, cracks or scratches. Be sure to search our other Pineapple and Floral available. We guarantee all items to be as described. Feel free to email with any questions. THANK YOU. 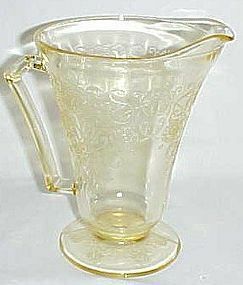 This pretty yellow Florentine Number 2 Poppy Number 2 depression glass Footed Cone Shaped 28 Ounce Pitcher measures 7 1/2 inches high and is in very good condition with no chips or cracks. 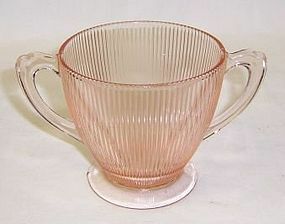 This Pitcher was made by Hazel Atlas from 1932 to 1935. 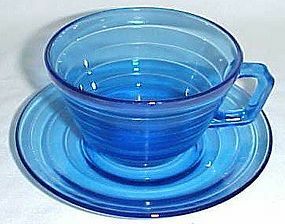 Be sure to search our other Florentine available. We guarantee all items to be as described. Feel free to email with any questions. THANK YOU.